Whenever I’m out socially and I tell a business owner that I do marketing for a living, there’s always a loaded question waiting just around the corner: “So, what should I be doing?” as if there was some secret to Kelowna marketing that I might be holding back. I’m not. I just can’t answer that question. Not honestly, at least. In a 5 minute cocktail conversation, I know about as much about your business as you know about mine. Your business is unique, and so are the marketing solutions that will work for you. Budget, goals and target market will all drastically alter your marketing plan. If you were looking for serious advice, I’d suggest we get together during the week and really hammer things out. That said, they’re only asking because they’re genuinely curious if I have a magic marketing trick that will below them away. I don’t – but I do offer some solid tips that should work for just about anyone just to help them out. So after the above disclaimer, I’ll give them a few nuggets of advice that won’t cost a cent, and that they should already be doing. 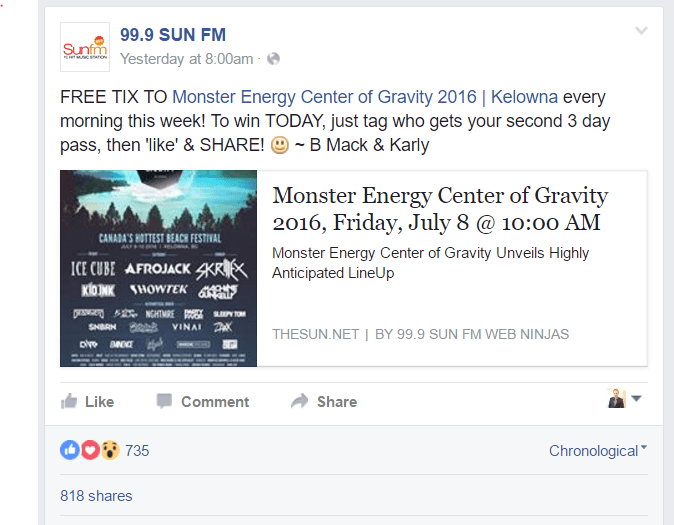 Here are 4 pieces of free Kelowna marketing advice that cost you nothing but time. Proper Hours. Make sure your store hours are up to date and correct. If people are searching for a solution to a problem, you could appear closed and they’ll move down the list. 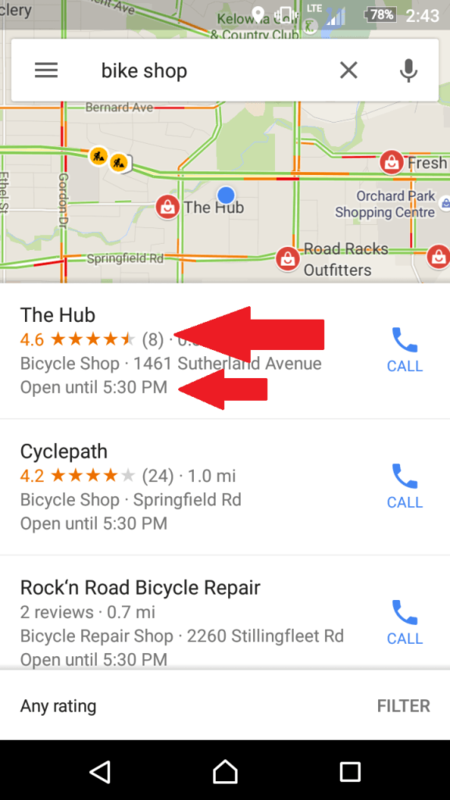 In the mobile screenshot I’ve provided for bike shops, Google tells the user how late the business is open when they’re searching. It’s important you claim the listing and get these details right. Pictures. Images of your business could show up if a user has attributed them to your shop. You’re better off adding your own to the listing so that people can see what you think are your strengths. Not some shaky cellphone photo taken in haste. Reviews. Get some. you can see the top two listings in the example image both have reviews. This is no accident. Reviews affect your SEO. The higher the review, the better. This is extremely simple, and so very valuable. I’ve already talked about how creating quality content helps with customer acquisition and SEO. Let’s keep rolling with a the bike shop example. Posting blogs about top 5 bikes for Kelowna life, tips for repair, top 10 Kelowna biking trails, local races, and tips to make people better riders are all great ways to be a resource for people. If your articles are good enough, hopefully the article will get shared around among bikers. Better yet – have bikers vote on their favourite things, and do an article about it. Engage them. Google also really likes sites that are updated regularly, that focus on a niche topic, and offer content that provides actual value. Start blogging. It’s worth it. The higher quality, the better. First, I don’t work for, or get any compensation for saying this. It’s just great Kelowna marketing advice. The team behind Kelowna Now at CSEK Creative is great, and they know their stuff. There are 3 free ways working with KelownaNow.com can hep you. Best of Kelowna. I know, these contests seem cheesy, but they can help in a couple ways. First, exposure. People read and vote on these things. Use your social media power to recruit votes. Second, SEO. Getting listed on a site more popular than your own will help you rank higher. In Focus. This is where they highlight a local member of the community – sometimes business owners. Exposure and SEO. It’s free and it helps. Business Listing. You may not of even realized this existed on Kelowna Now. Consider yourself enlightened. Same reasons as above. Mostly SEO though. Furthermore, anytime you can do something newsworthy and get on any local news site is worth it. Run a charity event and invite the media. It all helps. The benefits of social media should be obvious by now. I’m not going to spend a lot of time talking about what you know, but a little about what you may not know. First, follow other people in Kelowna. Businesses, popular people, news organizations, etc. 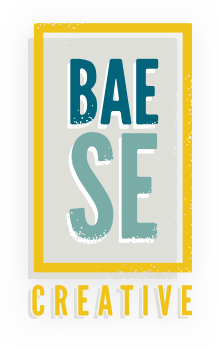 Start conversations with them where appropriate, and share any useful local information from them to your audience. Social media is a two-way street. Second, be local. Talk about Kelowna. Talk about more than just yourself. This can be wishing the Kelowna Rockets the best in the playoffs, support Kelowna Pride, and increasing awareness about the many charity golf tournaments and fun runs. Local people care about local things. Be local. Lastly, get visual. Share pictures and video. Since we’re on a bike shop kick, let me throw a few ideas out there: pictures of mountain biking locally, great road biking shots, new product video reviews, a go-pro shot of a time-lapse road run, photos of local biking legends – anything related to your niche. Get your audience to share things. Hold contests if that helps. Visuals perform almost 75% better on social media than just text. Don’t be afraid to see what others are doing locally, and use it for inspiration. How well each of these 4 things work for your Kelowna marketing plan will vary greatly based on your goals, your business and time. No matter what business you’re in, these 4 little things can make a big impact locally. If you don’t have time, contact us.